If you want to be sure that you receive particular messages, you can create a mail flow rule (also known as a transport rule) that makes sure that these messages bypass your Clutter folder. Check out Use Clutter to sort low-priority messages in Outlook for more info on Clutter. For additional management tasks related to mail flow rules, check out Mail flow rules (transport rules) in Exchange Online and the New-TransportRule PowerShell topic. If you're new to Exchange Online PowerShell, check out Connect to Exchange Online PowerShell. For more information about opening and using the Exchange admin center (EAC), see Exchange admin center in Exchange Online. This example allows all messages with title "Meeting" to bypass clutter. New-TransportRule -Name "<Unique rule name>" -SubjectContainsWords "Meeting" -SetHeaderName "X-MS-Exchange-Organization-BypassClutter" -SetHeaderValue "true"
In this example, both X-MS-Exchange-Organization-BypassClutter and true are case sensitive. You can check email message headers to see if the email messages are landing in the Inbox due to the Clutter mail flow rule bypass. 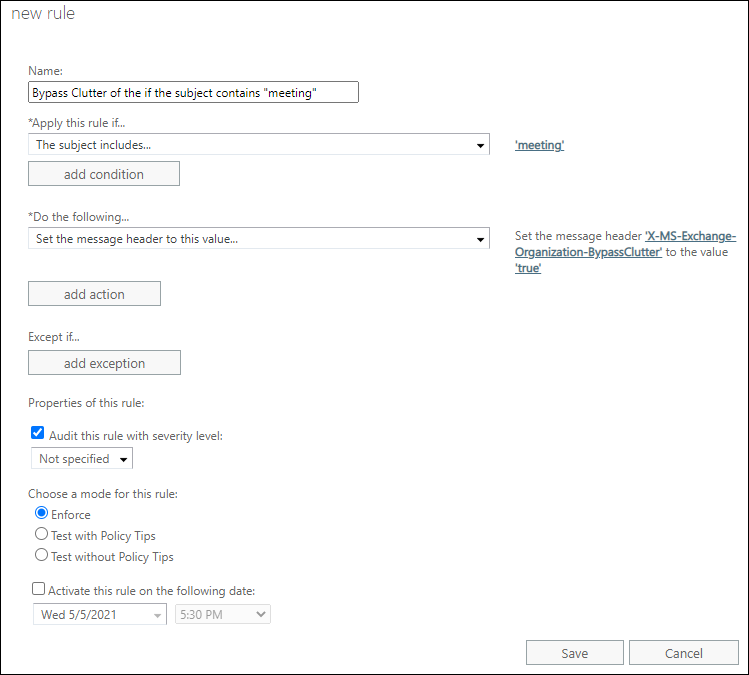 Pick an email message from a mailbox in your organization that has the Clutter bypass mail flow rule applied. Look at the headers stamped on the message, and you should see the X-MS-Exchange-Organization-BypassClutter: true header. This means the bypass is working. Check out the View the internet header information for an email message topic for info on how to find the header information. Calendar items (accepted, sent, or declined meetings notifications) won't contain this header.